You can install several application modules on top of LAMP. That way, all of the Bitnami-packaged applications you want to run will share a single instance of Apache, MySQL or PostgreSQL (depending on the stack) and PHP, which will save space and improve performance. 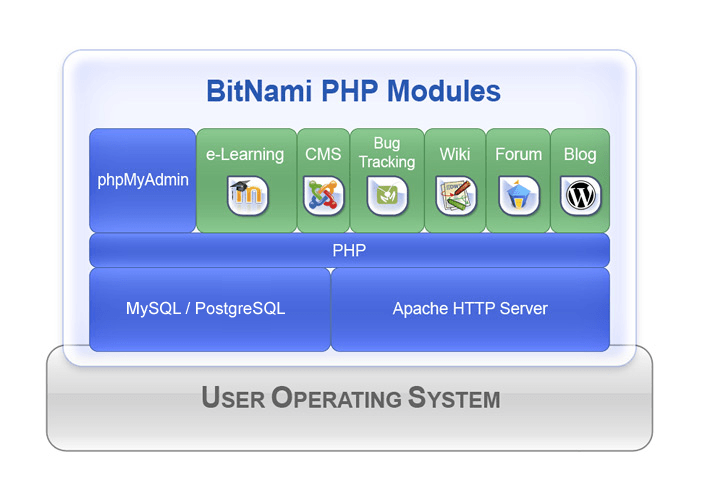 You can download and install any PHP-based Bitnami application on top of an existing Bitnami LAMP Stack deployment. Find a list of all the supported application modules. NOTE: You can only install PHP-based application modules on Bitnami LAMP Stack. NOTE: Both the URL for downloading the module and the name of the installer may vary depending on the application and version you are trying to install. Make sure that you are using the correct URL link and the installer name. NOTE: Bitnami offers both 32-bit and 64-bit versions of application modules. Use the version appropriate for your platform. If you’re not sure whether you’re running a 32-bit or 64-bit operating system, use the uname -a command. During the installation process, you will need to specify the installation directory of your Bitnami LAMP Stack. By default, the installation directory is /opt/bitnami. During the installation process, you will also need to specify the current database administrator’s password (the password for user root for MySQL databases and user postgres for PostgreSQL databases). This password is part of the application credentials. Find out how to obtain credentials in the FAQ. During the installation process, you will also be prompted to create an administrator account for the application, by providing a user name and/or an email address. Some application modules may also ask you to specify a password. NOTE: If not specifically prompted for a password, the default administrator password for the application is automatically set to the same value as the database administrator’s password provided in the previous step. This default administrator password can be changed at any time through the application’s Web administration panel or Web dashboard, after the module has been successfully installed. After the installation process is complete, access the installed application by browsing to http://SERVER-IP/APPNAME. For example, if you have installed WordPress, you can access it at http://SERVER-IP/wordpress. To access the application’s administration panel or Web dashboard, use the application administrator account credentials set during the module installation process. To run the installed application module using a virtual host instead of at http://SERVER-IP/APPNAME, use the conf/httpd-vhosts.conf Apache configuration file included with the module following the instructions to configure your application to use a virtual host.